BioShock 2 is a first-person shooter video game, developed by 2K Marin as the sequel to the critically-acclaimed BioShock. It was originally due for release on October 30, 2009 internationally and on November 3, 2009 in North America, simultaneously on the PlayStation 3, Xbox 360, and Microsoft Windows platforms, but it was announced on July 13th, 2009 that the game is to be delayed until the first half of 2010. The player will take the role of the first Big Daddy, a prototype for the Daddies seen in the original game. The character possesses superior speed and intelligence to other Big Daddies, as well as free will. As such, the player will be able to use the Big Daddy&apos;s drill and rivet gun as weapons, though the drill will overheat if used continuously. The rivet gun will have several types of ammo, similar to the first game. Alternatively, in contrast to other Big Daddies, the player may also use plasmids, while "upgrade trees" will provide unique ways to upgrade them. A new feature added is the ability to dual-wield plasmids and weapons at the same time. Further Big Daddy abilities found in the first game, such as performing a shoulder dash, will also be an option. The player will also be able to step outside Rapture into the ocean due to the diving suit they wear. Here the player can explore the ocean floor, recover from fights, marvel at the city from the outside and even pick up the special sea slugs at the ocean floor to gain more ADAM. These sea slugs create ADAM, the genetic material for the production of Plasmids. The Big Sister also appears to be a very serious threat to the player. When a certain number of Big Daddies are killed she will attack. Unlike the Big Daddies, she is lightning quick and arguably more powerful, able to extract ADAM from her enemies through a harvesting needle, straight into her bloodstream, which fuels "telekinetic abilities beyond anything previously thought possible". As a "rogue" Big Daddy, players will attempt to capture the Little Sisters from other Big Daddies who roam Rapture. Once a Little Sister is caught, the player will again have the option of choosing the fate of the Little Sisters. Harvesting remains a possibility in order to gain more ADAM, but rather than rescuing the Little Sister, players will instead be allowed to adopt them. With this option, Little Sisters will ride around with the player&apos;s Big Daddy, and will look for ADAM to harvest from corpses; in a manner similar to the proving grounds area of the first game, the player will then need to ensure that splicers will not harm the Little Sister as the harvesting process takes place. The Splicers will not damage the Little Sister, but will delay the process of gathering the ADAM. This will prolong the time it takes for the little sister to gather ADAM, allowing more splicers to attack the player and the little sister. Rescuing, while not initially an option for the player, will become available at some point in the game. Additionally the Little Sisters will also warn the player when the Big Sister is approaching. When the Big Sister is coming, there will be a countdown which gives the player an opportunity to set traps, buy items at a vending machine or place proximity mines. A sign that the Big Sister is approaching is when the Little Sister says in a singsong voice "Mr. B, Mr. B, Big Sister doesn&apos;t want you playing with me . . ."
Other returning features from the first game include the ability for the player to regenerate through the use of Vita-Chambers, and audio diaries. In addition to the single-player story, multiplayer will be a feature in BioShock 2, but this will not take the form of co-operative play. It has also been confirmed from the latest gameplay trailer that Gene Banks will return and that previous areas of Rapture still exist, such as the Kashmir Restaurant where the player started out the first game, complete with the iconic statue of Atlas. Set ten years after the events of BioShock, a number of towns around the world have been reporting kidnappings of young girls, with witnesses reporting the attackers as both extremely fast and thin, with red lights often reported as either being worn by the attacker or spotted nearby in the sea. This single attacker is in fact the Big Sister, one of the Little Sisters from the first entry in the series, who has mechanized herself in a similar fashion to the Big Daddies and has become the ruler of the underwater city of Rapture. Under her control, the city has reached an equilibrium in which she "actively maintains the city&apos;s infrastructure, and viciously hunts anyone down who disrupts the balance of power"; Tenenbaum, discoverer of ADAM and original creator of the Little Sisters, also states that the Big Sister has begun kidnapping girls to turn them "into creatures like her". Tenenbaum also states that she is a Golem character, hinting that her actions could be being manipulated by a different force. Initially, media reports suggested that the subtitle, "Sea of Dreams", would accompany the second entry in the series. However, this subtitle was supposedly dropped, before 2K withdrew the statement, stating that the "Sea of Dreams" subtitle would still be part of the full title. However, a later statement from 2K spokesman Charlie Sinhaseni clarified that the "Sea of Dreams" title was for the trailer, and not for the game itself.The first anything for Bioshock 2 came in the form of a Teaser Trailer that was available for viewing in the PS3 port of the first Bioshock. The first major details on the gameplay and plot of the game were revealed in the April 2009 issue of Game Informer magazine, around the same time that the "viral" site "There&apos;s Something in the Sea" was revealed. This site documents a man&apos;s investigation into the disappearances of girls from coastline areas around the Atlantic, along with a mysterious red light that accompanies each kidnapping. 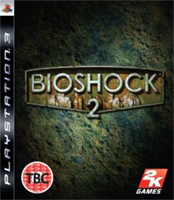 On April 9, 2009 on the Spike TV show GameTrailers TV with Geoff Keighley the first Bioshock 2 gameplay video was shown featuring the Big Sister. This demo showed many features including the ability to walk under water. On May 8, 2009, it was confirmed that Digital Extremes would be producing the multiplayer component of the game. In the multiplayer portion, players are put in a separate story where civil war has broken out in Rapture prior to the events of the first game. In the multiplayer mode the player acts as plasmid test subject for a company called Sinclair Solutions. As the player progresses through the multiplayer maps like Mercury Suites and Kashmir Restaurant they will either have the ability to hack security bots or search for the Big Daddy suit.